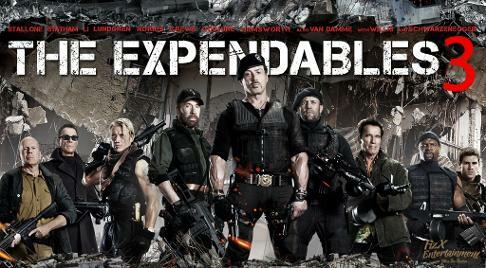 The Expendables, led as always by Barney Ross (Sylvester Stallone) return for a 3rd time and what great fun it is. It's the total over the top nonsense that we've come to expect from Barney Ross and his buddies but it's hard not to enjoy it as it's so obvious that everyone on the screen is having such a great time. The film opens with The Expendables rescuing an old pal called Doc (Wesley Snipes) from a moving heavily armoured train. We then move onto another mission where the Expendables have to take out an arms dealer, who to everyone's surprise turns out to be Conrad Stonebanks (Mel Gibson) the co-founder of The Expendables. After one of The Expendables is badly injured during the botched mission Ross decides that his old team, including Lee Christmas (Jason Statham) and Gunner (Dolph Lundgren) aren't up for the job and sets about recruiting a new younger group of Expendables. Ross, helped in his recruitment drive by Bonaparte (Kelsey Grammer), then travels the world putting together a new younger group to take on Stonebanks and his army of mercenaries. The new recruits include UFC fighter Ronda Rousey (the first female Expendable) and Galgo (Antonio Banderas, stealing the show as a fast-talking over the top team member who will do absolutely anything to join the Expendables). As if the cast list wasn't long enough Arnold Schwarzenegger returns to trade insults with Stallone's character and also to fire the biggest gun that he can carry. Even Harrison Ford manages to get in on that action as CIA boss Drummer. With The Expendables you get what you see, over the top action that's a throw back to the 80's. One of the younger characters even quips as their discussing how to break into Stonebanks fortress liar and Ross suggests that they go in "all guns blazing"," do you think that this is the 80's"
Will this be the last outing for The Expendables ? I would seriously doubt it as number 3 looks as if the batons being passed onto the next generation of action stars, saying that, I don't think that they'll ever match up to Stallone, Schwarzenegger and co.